We have a new challenge at Midweek Magnolias "Valentine", "Romance" and "Love" which are all my favorites! Can't get enough of the love! Our designers created some beautiful cards for the occasion so I hope you get a chance to stop by their blogs and leave them some love. 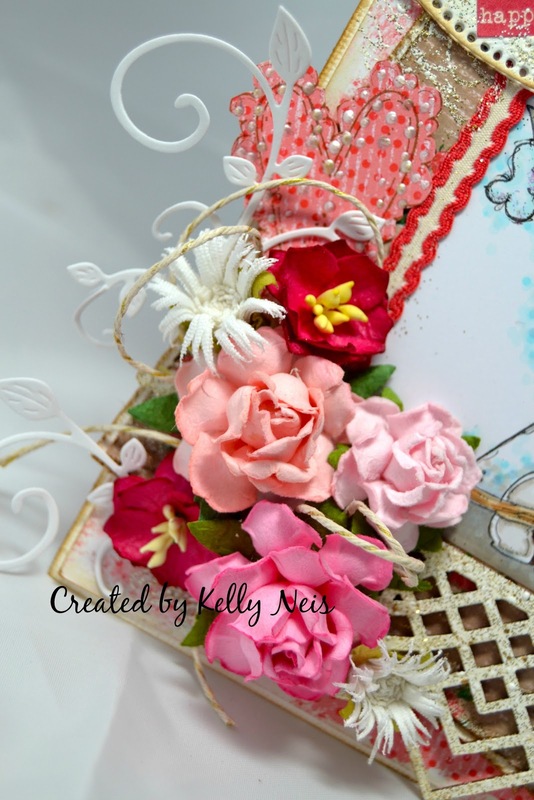 I usually pile on the papers but I only used one 12x12 Magnolia designer paper for this card. 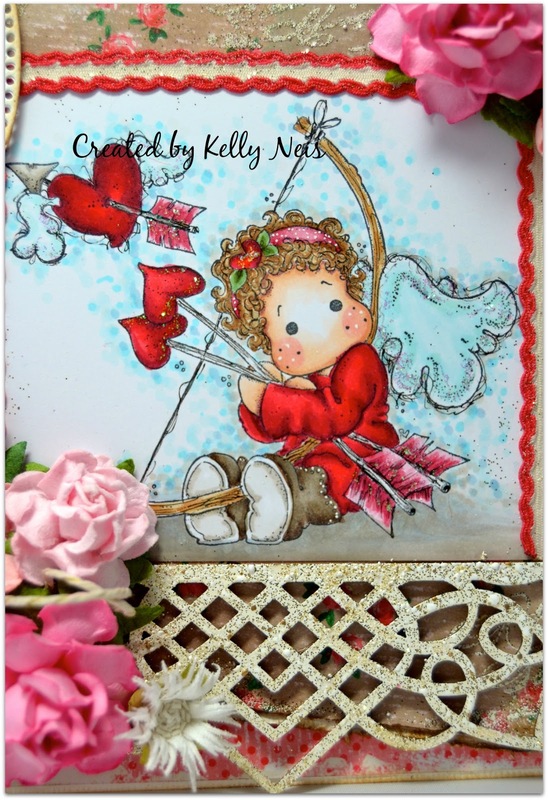 One of my favorite images "Tilda with Heart Arrows" is colored in Copics. 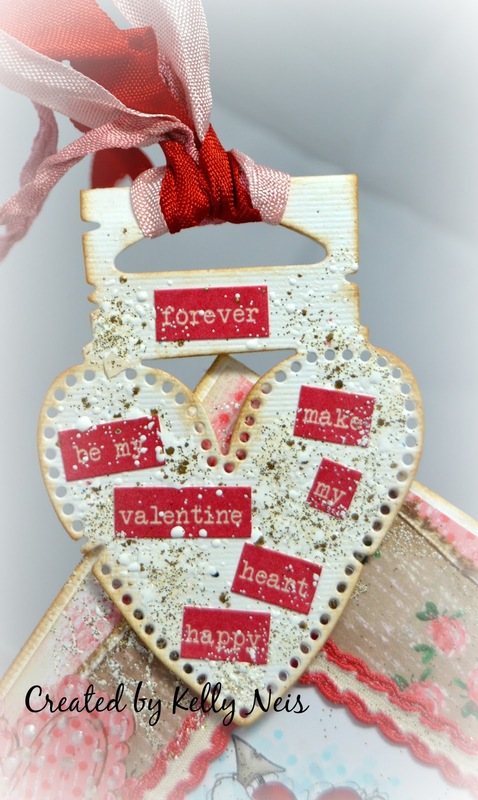 The tag is a Magnolia doohickey "So Wrapped Lovely Heart" die that I frantaged with Shabby White. I had some chit chat stickers that I made my message with. "Make my heart happy forever, be my Valentine." The bottom frame is a chipboard piece that I frantaged with Shabby White. I also have a ribbon going around the rest of my image to form the frame. Two angles of the card. Thank you for stopping by my blog today! Please join us for our new challenge at Midweek Magnolias Valentine, Romance and Love!! 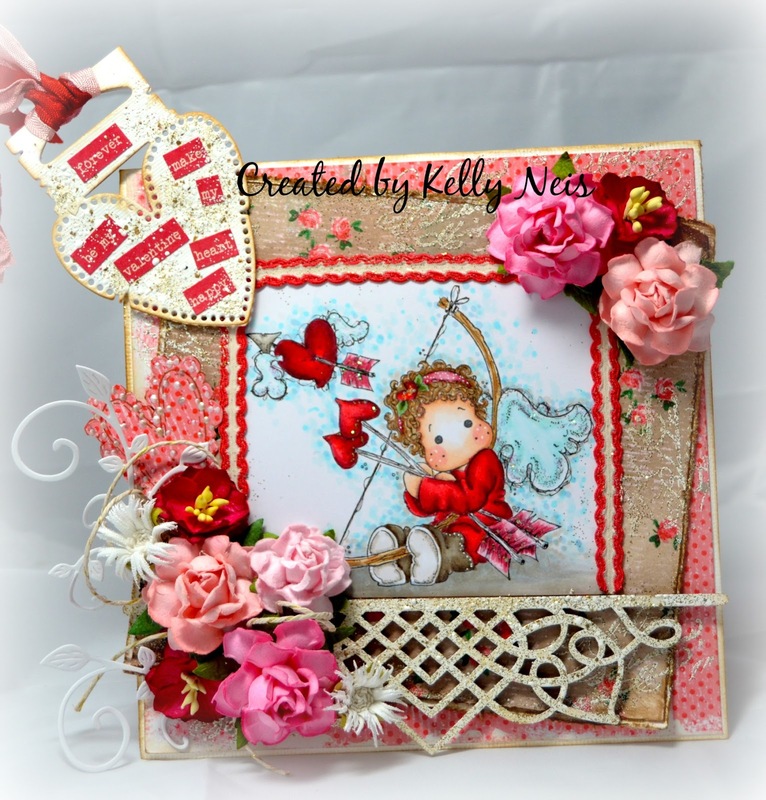 So pretty and romantic Kelly. We are in Fernandina Beach in Florida right now. It is in the northwestern part of Florida and I am happy to say we will be experiencing all four seasons. Yes we are moving here in April - we bought a fairly new house and I am over the hill happy. The house has been done in French Country colors and has a beautiful swimming pool. I do not have your new address or phone number - please send! I tried to email you but could not get it to go using my tablet. Might have something to do with being out of town. I have had a ton of computer problems in the last few months. My blog even posted the other day and I did not post!! Of course this is lovely and outstanding!!! 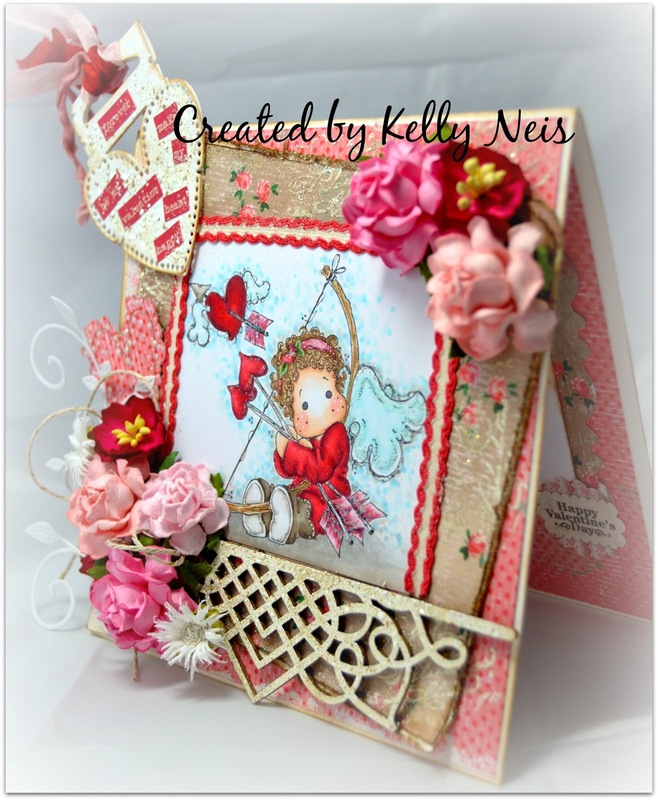 Your coloring is fabulous as well as all of your amazing embellishments. I love that Tilda! 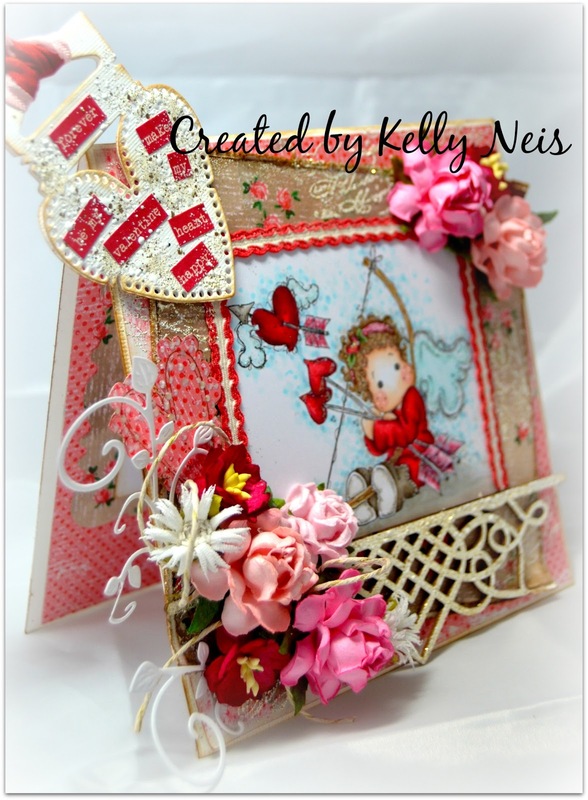 What a charming Valentine - the red and pink is so vivid and pretty and I love the ornate chipboard border at the bottom.